Anchors are heavy ! – Dirty wet dog , boats and sailing. And expensive, but a better investment than just about any other piece of boat gear. In real time today is the day when i get my knee replacement….so here’s to hoping that they ordered the right parts. By the time this post is scheduled to appear in the blog i will already be washed, scrubbed and at the hospital. In the meantime i have scheduled about 10 posts that were mainly finished. Hopefully the Inanda saga is over now although when i checked today she was still sharing a mooring with WABI”’. We have actually been to see a bigger boat but there’s nothing i can do about that for a while……so lets talk more about anchors. Many of my readers will know that i don’t spend much time in marinas or alongside docks and that i much prefer to be at anchor or occasionally a borrowed mooring for convenience. When i am alongside for a while its a dead certainty that i will go for a walk around the boats, see what there is to see and get some photographs for the blog. On the recent trip i spent a bit of time looking at boat’s anchors and their anchoring gear mainly to see what kind of boat is using what kind of anchor and how they set things up. During last years trip to south Brittanny as an example i found many generic Fremch cruising boats in the 35-40 foot range with suprisingly small anchors and light gear….10kg Delta’s and Bruce types were quite common. Now, the Delta is an anchor i like and maybe a lot of those marina boats don’t anchor much or very often….by some accounts most of those boats only get used for the 6 weeks of school holiday…but they still seemed under-anchored to me. My bad experiences with Bruce type anchors tells me that a 10kg Bruce (claw) is way too small for a 35 foot, high volume boat. Equally surprising in some cases was how light the anchor rodes were and from observation, how short. It looked to me that many of those boats were only set up to anchor ‘near the beach’ and on a nice day only. In this post i am going to generally explore anchors and anchoring again but from the perspective of just ‘how much’ anchor we need, how much chain and warp and then how to deal with that weight of gear once we have it aboard. Marking the rode during the delivery trip. I don’t sail the type of boat that i have just described but i did in the days when i raced because those were the boats that many current generic cruising boats are based on. Generally, wide and high-volume hulls that are quite fine to very fine forward and while we are describing the type….a deep fin keel and sloop rig. That type of boat dominated the industry, especially from the French yards almost entirely because of the number of berths that could be packed in. I can see the immediate (anchor related) problem with that style of boat as a cruising boat just by walking around the marina and that is the problem of having any amount of weight on the bow. With a fine bow to start with and a bow overhang any weight of anchoring gear and say a half-decent bow roller all of that weight is outside the waterline and having a negative influence on the trim and pitch characteristics of the boat. It’s as though the design can neither cope with the weight of decent gear or accommodate it anyway in the usual tiny bow locker. Nor is there a quick and easy solution except perhaps having high quality gear. Racing the original versions of those boats we learnt very quickly not to have any weight forward especially in a breeze downwind. One easy way to make an IOR boat broach in a decent breeze is just to send a porky crewman forward…just watch that bow go down and the steering go wild ! Our solution in those days was to tolerate very small anchors for the size of boat, short lengths of minimal chain and not much nylon on the end. Generally though the anchor weight and stowage position was specified in the rating certificate and usually stowed below……anchoring while cruising was then a pain in the bum. A typical example of gear on the OOD34 that i raced for years was a 25lb CQR anchor on a few metres of 6mm chain and maybe a hundred feet of retired 11mm climbing rope….and that was stored in a bin below just forward of the mast. The opposite situation seems to be occasionally represented by the , so called, serious cruising boats with oversized anchors and a metric arse ton of chain right in the bow…..and the owner wondering why the boat pitches a lot and is wet upwind. I haven’t told the story so far so i will now….once upon a time we were racing short-handed in the Solent with just 3 of us aboard the OOD34, luckily it was very light weather and we even managed a spinnaker hoist and drop, in fact with that little amount of crew weight we were doing well until the wind dropped completely and a foul tide kicked in. The skipper called for the anchor, i dived below, threw the whole thing on deck and then chucked the anchor over the bow. Yes i did remember to tie the warp to something but after a few minutes the skipper shouted for more warp….and then more….eventually i had to show him the bare end which i was hanging onto with a turn around the mast. Problem is that we were still drifting backwards so the next shout was to retrieve the whole thing and try to move inshore. The whole lot came in easily….except that when i say the whole lot there was a distinct lack of anchor on the end of the chain !. Now of course being the boat’s BN and general do-er of jobs i got the blame despite having never handled the anchor except to wash the locker out. The unfunny thing about that time was that the skipper was an experienced yachtsman by local standards and the anchor set-up wasn’t at all unusual in the various boats i sailed. Many of the IOR boats didn’t have proper bow rollers at all and i don’t remember one with a decent weight of gear …but then our general need was for a kedge when we couldn’t make over the tide. The problem when i came to anchor seriously for the first time was that now the IOR boat was a maxi and that the anchor could only be stowed in the mast bilge….i know because i did the stowage. I don’t even remember how the other mate got the 50kg Bruce and 10mm chain on deck because his watch anchored the boat that time….but i did realise pretty quickly that anchoring was going to be a problem at that size. The outcome of those years is that i came away with a poor understanding of anchoring and never having worked with decent anchors and well set-up gear. The first time i really had to think about a total anchoring set-up was when i was finishing building and fitting-out the Wharram Tiki 26 which came with no gear at all. At that point i had to start from basics and actually look at what anchor manufacturers and cruising books said about them. The good thing about small boats is that i could afford to experiment a bit with a few different anchors and varying combinations of chain, warp and yes…..retired climbing rope (being an ex climber with a retired abseil rope). I won’t detail that experience blow-by-blow but that i mainly settled with Delta type and Claw type anchors and quickly rejected plate type anchors (Danforth) as the one i tried just skated across the hard mud. What i was, was very weight conscious aboard that little catamaran as i had really just come from the long distance hiking world where weight of gear is a real issue. I tried to get as light a set-up as possible which would work, for example having a full weight anchor but just anchoring on warp….that worked except that in some conditions the boat would sail all over the anchorage ! I don’t think a small catamaran is typical as a good example of small boat anchoring problems as they can often have low actual weight but high windage and need heavier anchors than their size suggests. The positive aspect of setting up that boat is that i learnt to stow the anchor in such a way that it was on deck, actually on the forward trampoline , so accessible, but it’s weight was right next to the mast thus just about at pitch-centre. Something i have found that i really don’t like, small and shallow bow anchor wells, the anchor roller plate isn’t great either. While i am thinking about all rope anchor rodes do remember that chain is a fairly recent innovation and that all boats and sailing ships anchored on warp up until the 19th century at least. The practice then was just to use heavy anchors and thick natural fibre hawser. 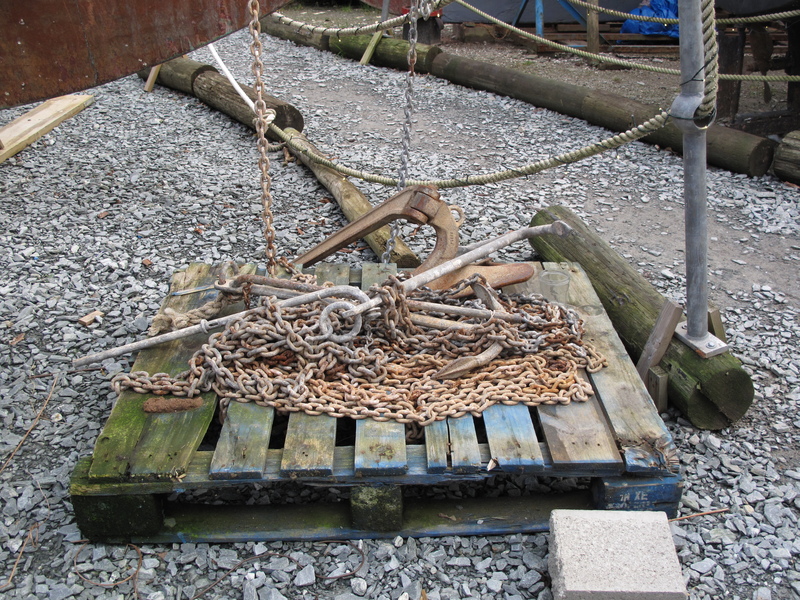 While chain is now the standard it is very heavy stuff and there is a good argument to be made for better and heavier anchors and lighter rodes….i remember that Steve Dashew who builds the ultralight ‘Sundeer’ boats has played around with that approach. I only stopped doing that myself locally because of the swinging circle and general gadding-about of a lightweight catamaran at anchor. I do also realise that nylon or polyester dragging across a rough bottom, coral debris for example, isn’t going to have a long life. The compromise that i find acceptable has always been some length of chain even just as a ‘leader’ and then plenty of warp. Frances 26 WABI” Delta anchor stowed in the shallow bow well. That must have been before i made custom anchor stowage chocks out of alloy fairleads re-shaped. The stowage position is about 4 feet aft of the bow. The Frances was in a way my dream boat and my version of a small ocean-going boat along ‘simple and rugged’ lines. The main evolution in my own anchoring in terms of anchor type and weight was to reject Claw type (Bruce) anchors completely and go over to the Delta type anchors as they seemed effective and reasonable value. They had also been taken up by the RNLI as their main anchor on the offshore boats. At the time the more modern types like the Rocna were only just appearing and seemed overly expensive and at that time there wasn’t much mainstream experience with them. Nowadays the Rocna and Manson have taken over the ‘best bower anchor’ slot but a Delta still makes a useful second anchor cost-wise i feel. What i did also do was work out my ideal anchor size, chain size and length, warp lengths, my anchoring systems and my anchor stowage. The Frances is somewhat unique in that it has a superb foredeck well and a stowage space below that which isn’t right in the bow. I had a proper anchor roller cage fabricated and hung that on the short bowsprit and routinely stowed both anchors at the aft end of the foredeck well. When cruising locally i would deploy one anchor directly from that position and then retrieve it over the bow roller if i was only sailing short distance. One anchor would then live on the roller and be up and down a bit as it was a regular practice of mine to move on every other tide and sometimes every tide. Locally i would mostly use the 10kg Delta anchor which had a ‘short’ rode which all lived on deck in a bag….then ‘offshore’ for example in Brittanny i swapped over to the larger 15kg anchor and its ‘long’ warp. For detail the long rode was 2 x the boatlength of 8mm chain and 100metres of 14mm nylon 8 plait warp. If you consult a table you will quickly see that the 15kg anchor is considered over-size for the boat but it was manageable and gave me the peace of mind to leave the boat anchored and know that it would be most likely to still be there when i got back from whatever else i was doing. The heavier anchor and chain arrangement was though just about at the top end of what i could handle manually in all conditions that i met and even then there were times that i had to be patient with the hook as it slowly came up out of the mud when well set. That boat was almost at the point where i needed a windlass or some other assistance with the gear. I bought but never fitted a clapper-plate and i think that was a mistake as they are a great addition. Above a 15kg anchor and say 20 kg of chain i would need a windlass now. Just to add here that when i think about weight of gear i think about total weight…..remember that 8mm chain is 1.4 kg per metre. Recently i discovered and started using a very high quality 7mm chain which is only 1kg per metre and consider the weight reduction worth the cost. What i would add though is that i would chose a 10kg Rocna or 11 Kg Manson over the Delta anyway although recent experience has taught me that i still might need mechanical help to get a well buried hook up. 2 of the usual 3 anchors i carried. Not visible is the deck bag for the lunch-hook rode. During the refit of the Frances i found a useful anchor stowage bodge which is to re-shape old alloy fairleads to use as anchor chocks. Instead of self tappers or bolts i put eye bolts through the deck and into a pad underneath….they then form the tie-down points for the anchor. If i was setting up an anchor system for the Frances today i would almost certainly go for a 10 or 11kg anchor of the type that i am using now, so either the Rocna or Manson as my best bower anchor. That choice nearly doubles the price over an original Delta type with a Rocna 10kg currently being listed at around £280 but interestingly the Manson equivalent at 11kg is cheaper at £220. Its a similar situation as i have now with a 6kg Rocna and a 7kg Manson….i just like that additional bit of weight so i would almost certainly go with the heavier but cheaper Manson. The Manson i think is an excellent anchor and i like the odd sizes they produce which i think give a nice choice of sizes….both a 7kg and 11 kg anchor have a very useful place in the choice of anchors in my opinion. For chain i would now use the hi-spec 7mm chain but go up slightly on the length, 20 metres rather than 15 which works out as 20 kg of chain rather than 21kg in the original set-up. The reason for that with the Frances is that she has 4 feet of draught and was often anchored slightly deeper than i can get away with now. The 7mm chain being 1kg per metre compared to 1.4kg per metre for 8mm chain cab either be used as a useful weight reduction or allow for more chain. Warp could re reduced in length as so far i have never used even half of what i had, a 70 metre chain/warp combination with 20 metres of chain should work at a 4:1 scope in 18 metres depth which would be a highly unlikely deep anchorage even on the north Brittanny coast. For genuine ocean cruising i would definitely keep a 100 metre warp available. The final part of a hypothetical set-up for a heavier boat like the Frances or similar would be a dedicated rock-hook for rock/kelp bottoms. I used to have a very good smaller admiralty pattern anchor, like a fisherman but with a heavier fluke arm, for those conditions but never had to deploy it. My current problem is of course my little Liberty which has all of its primary anchor gear weight right up in the bow well and although not a huge amount it is relative to the boat size. The good thing about the liberty hull shape is that it is fairly full forward on account of the main-mast being up there so it maybe has less of a problem than a fine bowed boat. I do think about my total weight forward though which is 7kg for the usual anchor and 15kg for the chain plus about 4 or 5 for the additional weighted warp. I don’t need or have much warp, what i do have is a bag of 30 metres of 12mm weighted warp and a 75 metre warp in reserve. Most of my anchoring now is in very shallow water and its quite usual for me to effectively be on all chain in most anchorages…..or be high and dry !. I think i benefit from a mainly chain rode with WABI”’ because she is the worst behaved boat at anchor i have ever had and that is because of windage on that forward rig. What i should mention is that i do carry 2 anchors and that both are full size for the boat, my second anchor, the 6kg Rocna is routinely only set up on its 75 metre warp but i do have some spare chain in the boat. That second anchor has been useful as a couple of times i have walked it out with the boat dried out to use as a hauling-off anchor to help me pull off the beach during a bouncy rising tide. Walking the anchor out into deeper water in the Exe. I could save 1 kg easily by swapping back to the 6kg anchor which is easily good enough for the boat. I also think that 10 metres of chain would be adequate for the Liberty and that would be another 5kg off the total weight on the bow. My actual solution is to accept the weight forward for local cruising but if i am going coastal/offshore i bring the whole lot aft and have it in the cockpit or stow it below. I do think that helped me in brisk conditions a couple of times, in a way that method is a bit like the old sailing ship routine of sending the anchors below on a long voyage. At the end of one of those ‘fast-dash’ passages i just deployed the anchor from the cockpit and only then walked the warp up to the bow. The final part of my anchor set-up to mention is my pilot boat style bow fairlead which needs a rebuild with a roller, that is one project i have put aside for workshop time during my knee recovery. That design was a specific solution to the problem of the boat wandering a lot….the rope exit is actually very smooth just like its larger pilot-boat original. Something i would like to return to is a simple method of deploying my anchor from the stern, where i work, but then pulling the anchor warp up to the bow. I have succeeded in that but the system was a bit messy and needs simplifying. The reason for persisting with that idea is to continue to perfect the idea of doing as much work as possible from the cockpit. One possible solution is to have the lighter anchor in a bag in the bow-well just on a weighted warp and have the main bower anchor stowed and deployed from aft. That system would also need a bow arrangement that had the anchor automatically deployable on the bow. A Delta anchor will do that but the Rocna and Manson anhors are slightly more difficult to stow. My anchor stowage on the Liberty is a bit sloppy compared to previous boats , it sits in the little bow well ok but space is tight and there is only one lashing point, if i’m not careful to stow the chain properly it can easily end up down in the mast slot and get snagged there, what it would benefit from is a bow storage bag like the one i had on the Frances which i think may have been a climbers or arborists rope bag : ideally it would have a heavy custom built one. Briefly…..Inanda. I knew i would have to move all of the gaffers anchoring gear as soon as i took her over as the hook itself lived on the bow and there was 25 metres of chain right up in the bow. My simple solution was to keep an anchor on deck, i borrowed the Manson from WABI”’ and stowed that at the port shrouds and the chain in a bucket just forward of the rig. Even with 50 lbs moved 6 feet out of the bow she still pitched badly. That was disappointing in that my research about the Falmouth quay punt ‘Curlew’ suggested that getting a chunk of weight aft should have improved the handling. What do you mean the kedge is dragging again ? High quality anchors really are worth more than their base cost. Dedicated cruising boats need more than one anchor. It is possible to accept lighter gear if the anchors are the best ones available. It is generally better for most modern boats not to stow heavy gear such as anchors right at the bow especially upwind/offshore. Having proper anchor stowage not on the bow isn’t difficult to achieve. Chain and warp rode seems to be the best available compromise and with something along the lines of 1.5 or 2 times the boat length of chain.